0.14% Native American, 7.49% Asian, 0.04% Pacific Islander, 0.01% American Indian and Alaska Native, 0.93% from other races, and 1.76% from two or more races. Hispanic or Latino of any race were 3.2% of the population. There were 13,422 households out of which 31.6% had children under the age of 18 living with them, 54.2% were married couples living together, 8.5% had a female householder with no husband present and 34.7% were non-families. 28.5% of all households were made up of individuals and 8.6% had someone living alone who was 65 years of age or older. The average household size was 2.40 and the average family size was 3.00. In the town the population was spread out with 24.1% under the age of 18, 6.0% from 18 to 24, 30.9% from 25 to 44, 25.9% from 45 to 64, and 13.2% who were 65 years of age or older. The median age was 39 years. For every 100 females there were 92.4 males. For every 100 females age 18 and over, there were 89.4 males. The median income for a household in the town was $58,669 and the median income for a family was $68,472. Males had a median income of $48,742 versus $34,796 for females. The per capita income for the town was $29,508. About 2.4% of families and 4.1% of the population were below the poverty line, including 2.8% of those under age 18 and 4.0% of those age 65 or over. 64.9% of workers are employed in the private-sector, and 29.1% are government employees. View a Map of the Coverage Area Here. 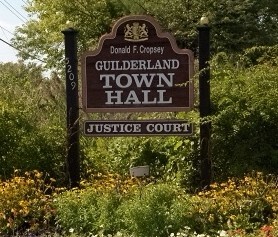 Additional information about the Guilderland Area can be found on the Guilderland Chamber of Commerce Website.